What is the Islamic Movement of Nigeria (IMN)? The Islamic Movement in Nigeria is a religious and political organization based in the northern region of Nigeria headed by Sheikh Ibraheem Zakzaky. The IMN began when Ibrahim El-Zakzaky, who is said to have become so impressed with the 1979 Iranian Revolution that he wanted one at home. Later, Zakzaky went to Iran, ultimately becoming a Shia cleric. At home, he became the leader of the Islamic Movement in Nigeria and turned it into a vehicle for proselytizing and gaining followers in the 1990s. The activities of the IMN pose a grave danger to the Nigeria polity. From time immemorial, they bestrode most states in northern Nigeria with their actions which in most instances do not share the regular Islamic calendar in Nigeria. They were above the law; they were never law abiding. It is instructive to state that the IMN was becoming a threat to the sovereignty of Nigeria before the advent of the present administration. For example, Shiek Sanusi Abdulkadir Koki, the new leader of the IMN was quoted as saying “As followers of Sheik Ibraheem El-Zakzaky, we shall never submit ourselves to the dictates of the Nigerian government even if our own lives will be taken away by the forces of its security agents.”Isn’t the above statement a treasonable offense? Can there be two captains in a ship? Are they above the law in Nigeria? For the IMN, it is a history of unjust rebellion against the state or constituted authority, and not a registered organization in Nigeria, despite its near 40 years of existence in the country. But more than anything else, what has bolstered the IMN to lay siege on parts of Nigeria violently is the active support it receives from the Republic of Iran. During the hearing at the Kaduna Judicial Commission of Inquiry on the Army/Shiites clash, stories were told by eyewitnesses on how the Islamic Movement in Nigeria terrorized the Zaria community for over 40 years. 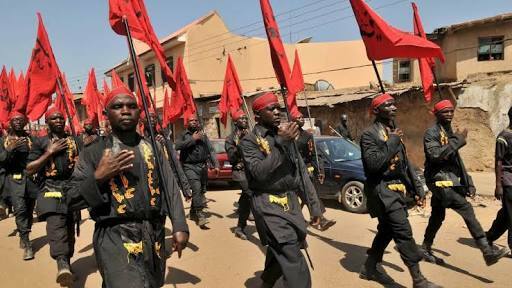 The chairman of Zazzau Emirate Development Association (ZEDA) Mohammed Balarabe narrated how the movement threatened the emirate, saying that the Shiites take laws into their hands and are always in the habit of shutting down the roads while holding a procession. As a flashback, El-Zakzaky has a turbulent history of confrontation with the Nigerian state. He emerged in the late 1970s preaching Islamic revolution and the overthrow of the constitution. His fiery preaching, widely circulated, on audio cassettes criticised emirs, governors, presidents, politicians, and soldiers; called for the ouster of Nigerian governments which in his view were run by “kaffir, thieves, and satans” and held up revolutionary Iran as his model polity. His combative and provocative style naturally set him on a collision course with the authorities. Between 1980 and 1999, El Zakzaky spent nine years in prison. The IMN’s rhetoric has in most cases translated into violence. In 1991, an IMN imam in Katsina state, Yakubu Yahaya, whose hero was Khomeini, led hundreds of IMN members in an attack on the office of the Daily Times newspaper after it portrayed the Prophet Muhammad in a cartoon marrying a prostitute. In the 2000s, the IMN clashed most frequently with Sunnis in Sokoto, which is the seat of the Sultan of Sokoto and where Nigerian intelligence reported that IMN established training camps for recruits from across northern Nigeria. In 2005, IMN imams sought leadership positions in mosques in Sokoto, which led to violence between Sunni and Shi`a. It is even more curious to note that the IMN has sympathizers in government who have continued to protect their interest despite its threats to peace and stability. Hence, how could one explain why the group has not been proscribed by the federal government just like it did in the case of the Indigenous People of Biafra (IPOB) despite the human and economic casualties that have come about as a result of their nefarious activities? We all know that hundreds have been killed including policemen, military officers, women and children and other unarmed civilians in most northern states. We also witnessed the public attack of law enforcement officers in Abuja by followers of the IMN. There have also been instances where these individuals troop into the federal capital territory (FCT) and causing a total lock down the city. I mean where is that done? Only in Nigeria, I guess. So in a way, it defeats common sense as to why the Attorney General and Minister of Justice of the Federation had maintained an unholy silence. Meanwhile, sometime in September 2017, the federal government stated that every other group that operated like the secessionist group, Indigenous People of Biafra, would also be proscribed and tagged as a terrorist organization. The Senior Special Assistant to the President on Media and Publicity, Garba Shehu, said this during a live television programme titled, ‘Sunrise Daily’ on Channels Television. But till date, nothing has been done. Just maybe IMN hasn’t caused enough havoc to be so designated a terrorist group. And also perhaps IMN is not as violent as they appear regardless of the open confrontations they have had with the relevant security agencies, including an attempt on the life of the Chief of Army Staff. And maybe we have to wait until things get out of hand just like the Boko Haram conflict. But whatever the case perhaps, it is evident that the sympathizers of the IMN in the corridors of power are having their say, hence why this violent group has not been proscribed. Ibekwe is a public affairs commentator writing from Enugu.